During winter, your home may become uncomfortable, as your windows may not be able to fully protect you and your family from the weather well. This may happen due to different factors, such as 1) undetected gaps that may let cold air into your home 2) faulty installation or 3) insufficient window insulation. If not addressed immediately, your home can be really cold when winter comes. You know what you can do to prepare for the cold weather? Invest in new windows with effective insulating properties. 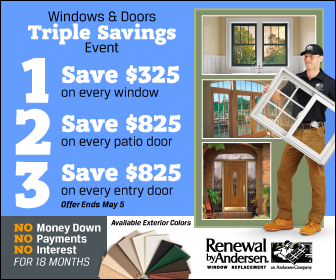 At Renewal by Andersen®, we can give you quality windows that are not only great for insulation, but are also able to seal leaks, drafts, water, and wind. First of all, we use Fibrex®, an innovative exclusive material, in creating our windows. This frame material can definitely withst and extreme weather conditions. But more than the revolutionary frame, you can get our St. Charles Missouri energy efficient windows with different performance glass options. Get windows with High-Performance™ Low-E4® glass or High-Performance™ Low-E4® SmartSun™ glass. These products are 45% more energy-efficient in winter than conventional dual pane glass. They are also more efficient during summer by 56% and 70%, respectively. You will have a home that is cooler in summer and warmer in winter without increasing your energy consumption. As part of the Andersen Corporation, locals call us for replacement doors and windows installation in St. Charles MO and other locations across the state. With years of experience in the industry, you can be confident to get high quality products from us. Furthermore, we continue to improve our services and products to make sure they meet the changing needs of the market. Contact us for more information on replacement windows and the benefits you will get from them during the cold months. We’d like to hear from you!